The universe is comprised of a large amount of invisible matter, dark matter. It fills the space between the galaxies and between the stars in the galaxies. Since the prediction of the existence of dark matter more than 70 years ago, all sorts of researchers – astronomers, cosmologists and particle physicists have been looking for answers to what it could be. With the latest observations from the Planck satellite, researchers from the Niels Bohr Institute, among others, may be closer than ever to a solution to the origin of the mysterious dark matter. well as rotates once a minute on its own axis. surrounding Universe in the course of six months. 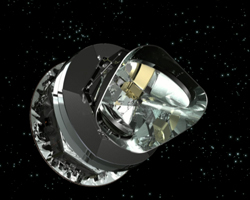 The Planck satellite, which was launched in 2009, has extremely sensitive instruments that can map microwave radiation in the entire sky with great precision. The latest data from the Planck mission reveals unusual radiation from our own galaxy, which open a new direction in understanding the most fundamental properties of the space, time and matter in the Universe. “The Planck Satellite has observed a very unique emission of radio radiation from the centre of our galaxy, the Milky Way. By using different methods to separate the signal for very broad range of wavelengths, the Planck team has been able to determine the spectrum of the radiation. 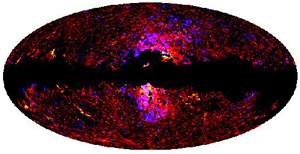 The radiation has a spectrum which has the same form as that of synchrotron emission, which originates from electrons and positrons circulating at high energies around the lines of the Magnetic Field in the centre of the galaxy, and I believe that there are quite strong indications that it could come from dark matter,” explains Pavel Naselsky, professor of cosmology at the Discovery Center at the Niels Bohr Institute at the University of Copenhagen. Pavel Naselsky explains that leading scientists like Niels Bohr professor Subir Sarkar have predicted, using calculations, that dark matter may consist of very heavy particles that are around 10 times as heavy as the Higgs particle, that is to say, 1,000 times heavier than a proton. But they have very unique properties and do not interact with ‘normal’ matter particles. Dark matter particles are also usually very scattered and do not interact with each other. in the centre of the map is the new abnormal radiation. “But we know from theoretical predictions that the concentration of dark matter particles around the centre of galaxies is very high and we have a strong argument they can collide there and in the collision electrons and positrons are formed. These electrons and positrons start to rotate around the magnetic field at the centre of the galaxy and in doing so produce this very unusual synchrotron radiation. It has simply not been possible to observe this radiation in such detail before, as previous instruments have not been sensitive enough. But with Planck, this unusual radiation is seen very clearly. “The radiation cannot be explained by the structural mechanisms in the galaxy and it cannot be radiation from supernova explosions. I believe that this could be proof of dark matter. Otherwise, we have discovered absolutely new (and unknown for physics) mechanism of acceleration of particles in the Galactic centre”, says Pavel Naselsky, and he expects exciting new results already within the next few months. The results have been published in ArXiv.org. and submitted to the scientific journal, Astronomy and Astrophysics. The views presented in this article which are not already described in arxiv.org/abs/1208.5483 do not represent the opinion of the Planck Collaboration. The universe is filled with dark matter. The visible celestial bodies like stars, planets and galaxies constitute only about four percent of the total matter in the universe. The vast majority is dark matter and dark energy. Dark matter is not visible because it neither emits nor reflects light. It is invisible, but it has mass and thus has gravity that can be measured. By analysing the galaxies you can weight them and it turns out that most of the matter in a galaxy’s total mass is dark matter. Exactly what it is is a mystery that researchers are working hard to solve.